When I talk to you gals and guys—aka our wonderful and did I mention super smart audience? ;)—you frequently say coming up with ideas can be difficult. 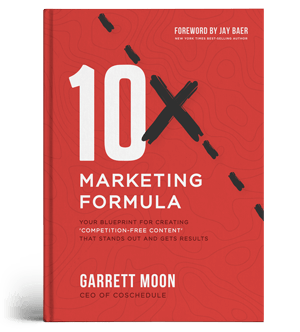 Sometimes, you say, it’s nice to have some inspiration to get the wheels moving in your heads for what you could do to 10x your marketing. That’s why it seems like there’s no better time than now to fill you in on all the different content types you can organize with your marketing calendar. I’ve actually tackled this topic before in a super comprehensive blog post for Convince and Convert, which their audience really seemed to love. And today, it’s a great time to revisit content types because CoSchedule’s designers and developers just launched a brand new feature to help you get even more organized than ever before. CoSchedule has always been your favorite marketing calendar for blogging + social media. And while you could always organize tons of other marketing projects in CoSchedule, too, many of you love the idea behind customizing your calendar for your own business. So now you have even more initial options of content to create when you’re ready to create content. And you can now even add in your own custom content types—complete with your own icons and content names—to help you organize exactly what matters most for your marketing team. So to help you decide which content types to add to your marketing calendar, I thought you'd dig a super comprehensive list of ideas, complete with examples of how other marketers have used them successfully. This post is not designed for you to try everything. It's meant to serve you ideas that just might work. And the links provide additional context on how to start each tactic. You likely have company news, product announcements, and a ton of other stories that deserve to be told. Like a traditional newspaper or magazine publishes articles, you can, too. As Joe Pulizzi, the godfather of content marketing likes to say, companies are now publishers. So it's perfectly acceptable for marketers to borrow ideas from the traditional publishing world to better engage their audiences. While podcasting is becoming more popular, there's also a lot of opportunity to turn the written word into audio content. With easy-to-use tools like Audacity, you can record yourself reading your e-books, blog posts, and course lessons out loud, host the audio on a service like Libsyn, and embed the audio files in your content with podcast plugins like the Podcast Motor Player we use on the CoSchedule blog, or the Smart Podcast Player from Pat Flynn. Blog content can take many different formats—how to, list, question, why, etc.—and usually serves to educate prospect customers. Blog posts are usually at least 1,500 words long and help your audience solve a problem on their own, empowering them to become amazing at what they do (and subsequently give them more reason to use the product or service you're selling). Studies have found those who blog regularly are most likely to reach their goals. A case study shares a customer's success story they experienced when using your product or service. These can take multiple different formats like video or written word, and are a robust testimonial that encourages prospective customers to consider your business as they look to resolve similar challenges. A common formula for case studies covers what the problem was before implementing a change, how the customer changed, and what the results were after the change. E-books are an excellent way to break up long-form content into digestible chapters. An easy way to start an e-book is to select existing blog posts that flow logically together to repurpose your existing content. From my experience at CoSchedule, there has been no higher-converting content type for trial signups than our free e-course. 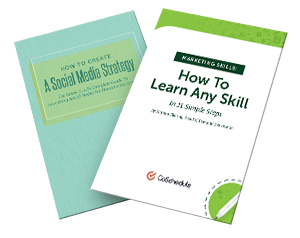 While e-courses take many formats, our Marketing Strategy e-course offered five written lessons (complete with quizzes), two intensive workshops, and helped students connect with one another in a course-dedicated Facebook group. Upon completion, our students could get certified only if they shared their completed marketing strategy with us. Another method for implementing an e-course could be as simple as setting up marketing automation with your email service provider. Upon signing up for a specific email list, you could email each lesson to your students. Email marketing is one of the most effective ways to consistently reach your audience. In its simplest definition, this tactic involves curating and sending valuable content to your subscribers. Infographics deliver research in an easy-to-understand, visual layout. Since they're typically long and narrow, they're the most-shared type of content, particularly because they're naturally optimized for Pinterest. Newsletters round up your recent content, content around a theme, or recent events happening/coming up at your business to deliver a ton of value to your audience in one piece of content. E-newsletters are super popular these days, though you can stand out by literally printing and sending newsletters to your followers since only 6% of marketers use this approach. Great content with poor design is still poor content. Sometimes, it is necessary for you to plan photo shoots to get your own custom photography and avoid stock. Now with CoSchedule, you can manage those shoots as projects on the marketing calendar where you organize everything else. Memes, animated GIFs, comics, cartoons, and even screenshots can all be valuable visual content. Podcasts are an effective way to reach someone on the go, commuting, or while they shower. Seriously. A mere 57 million Americans listen to podcasts regularly, with an average listener checking out five podcasts every week. Think of this content type like an educational or entertaining way to reach your audience through audio, distributed through outlets like iTunes, Stitcher, SoundCloud, and Google Play. Special promotions can cover a lot in the marketing world. An idea here is to plan a promotion around an industry event, holiday, season, or other timely events. For example, online stores and software as a service (SaaS) companies plan promotional sales events around Cyber Monday. What if, instead of posting a single social media message to engage your following, you scheduled an entire queue of 10, 20, or heck, 30 messages across all of your social networks? You'd get more engagement. If you scheduled your campaign to share your website or blog, I know for a fact that you'd get more traffic. In 2017, some predict 74% of all Internet traffic will be video. So video is huge. For marketing purposes, videos are great for showcasing culture/behind-the-scenes, product demos, service overviews, product ads, customer testimonials and case studies, fan shoutouts, team recruitment, event pre-promotion, entertainment, education, about us, and a whole lot more. Webinars are kinda like a class you teach your audience as an event. You select a specific time and day, promote the event to your audience, and host the webinar usually with a deck and speaking points. This type of content has been very effective for us at CoSchedule to connect the dots between educational content marketing and the CoSchedule marketing calendar. In fact, it's one of the content types we plan to do even more of in 2017 because of its efficacy. Think about traditional web page content. Some folks call this brochureware content—the kind that is slightly deeper in the funnel, existing to teach your prospects how your product or service solves their challenges. This could also include e-commerce product pages and beyond. Several years ago, Google's Zero Moment Of Truth study found that most folks are likely to research 9.4 pieces of content before making a purchase decision, which makes this type of content extremely powerful for influencing sales. White papers often describe the benefits a prospective customer will get when they use a specific product or service from your business. These are most often used deeper in the funnel to encourage a prospect to make a purchase decision. ^ What I mean by that is simple: The following tactics can apply to any kind of content you create—blog posts, webinars, e-books, and beyond. "Guesting", in marketing terminology, is when you accept, publish, and share guest-created content. A common form of this is guest blogging, though you could embellish upon this tactic well-beyond your blog. At CoSchedule, we've found a particularly helpful form of guesting involves user-generated content. For example, our friend, Dustin Stout from Warfare Plugins, wrote a guest blog post that outlined how he uses CoSchedule's Social Templates feature to organize his social media posting schedule. That blog post is incredibly helpful for our audience to understand how others like them are benefitting from using CoSchedule, instead of only hearing that sort of advice directly from CoSchedule's own marketing team. Similar to guesting, this is when you work together with another person or business to co-create content. This way, you tap into external knowledge and skill sets to create great content all while reaching a larger audience. Great collaboration examples include e-books, webinars, and free guides/templates. Interview content is similar to Q&A where a host questions a guest. Interview formats work well for podcasts, videos, and even blog post content. The process is usually really simple for both host + guest, which makes it a great form of collaborative content. Plus, as a host, you give your audience access to new insights while also dipping into your guest's audience pool. Questions and answers have always been an effective form of content. Simply ask your audience what questions they have that they'd like your advice on solving, then create content that provides the answer. A similar format is the ever-increasing-in-popularity, Ask Me Anything, that takes place on platforms like reddit and other up-vote communities. With this format, you literally dedicate time as an event to allow folks to ask questions which you answer live. Quotes are motivational/inspirational/entertaining/educational quips, usually from influencers. They are a powerful way to increase engagement on social media or to prove points within larger content pieces. Testimonials are a form of quote, but come directly from your customer base about your product or service. These work wonders as social proof on your website landing pages where your goal is to convert new prospects. For example, when CoSchedule decided to host our own podcast, we looked at folks who could help us with editing and the tech behind the scenes. All it took was one testimonial and a phone call with Podcast Motor to gain our business for the long haul. Your business is ever-evolving, growing quickly to better serve your customers. Every improvement you make is a story worth sharing with your audience. Company news often takes the form of press releases, articles, media pitch packets, and outreach. Where company news addresses process improvements and culture stories, product announcements share what's new with the actual service you sell. For software companies like CoSchedule, these announcements are often covered in feature blog posts and go well beyond into Product Hunt, Inc.com, social media messages, and more. Are there competing products in your niche? Chances are, your audience may appreciate your professional experience on which is best. For example, Groove actually maintains landing pages which compare its product versus its competitors. Contests often take the form of "enter to win". You can ask your audience to do something, show you what they've done, and they get the opportunity to receive something awesome. You can optimize many forms of content to help your audience find what you publish via search engines. This form is often applied in all online content as a long-tail play of generating traffic long after your content publishes. Calculators are handy for helping your audience discover how much time/money/resources/etc. they could save by using your product or service. Hosting your own forum gives your audience a way to ask questions and field answers from their peers. This type of content builds a community around your brand, empowering user-generated content #ftw. Something exciting happen at your business? The old school news release can still work for generating media coverage and customer attention. Landing pages help you share the benefits of your product, service, or even piece of content while optimizing your visitors to convert. These may include testimonials, case studies, and stats to teach your prospects how they are missing out by not using what you're marketing. The feature page is a type of landing page dedicated to covering the specifics of one product or service. This works particularly well when coupled with paid search engine marketing to direct specific, niche keyword traffic to your website. Have a bit more to say than what a simple landing or feature page can't quite do? Microsites work well for communicating the story around a particular campaign. You've probably visited Wikipedia a few times by this point... which is largely made from user-generated content + editing and policing. Like forums, Wikis give your audience the opportunity to share knowledge among their peers while positioning your brand as the go-to source for that kind of niche information. A similar concept is creating an industry-specific dictionary. If you manage an extranet (a website specifically dedicated to providing customer content gated behind a login) or a SaaS product, in-app messages work really well for reaching your users. Check out a tool like Intercom to get started. This is the classic educational tactic where you literally teach a reader how to solve a problem. This method involves giving step-by-step, actionable advice your readers follow as they solve a challenge by themselves (albeit, with your extremely helpful advice). List posts (like this one!) often provide ideas rather than education. Think of headlines like 10 Ways To Get More Traffic To Your Content where finding the ideas is often more important that learning the specifics of actually executing them. The headline of your blog post is a question. The body of your blog posts is the answer. This type of content works particularly well for beginner content creators to establish a content foundation for your blog. Why blog posts work well for explaining how things are. Think of headlines like Why You Don’t Need Approval (+5 Bonus *Unconventional* Lean Marketing Ideas). These kinds of blog posts work well for opinions and rants, but also factual explanations. Brian Dean from Backlinko shared a process he coined to rank higher in search engines called the Skyscraper Technique. This is a new method, and is now a term many in the content marketing + SEO community reference regularly. By naming the process he shared, Brian gets a lot of cred + backlinks to his original content. Ye olde roundup: Find the best content in your niche on a specific subject, then write a list post linking to those resources. You can do roundups of the week, month, year, etc. Your audience likely has questions you can answer by curating data points into one comprehensive blog post. For example, CoSchedule's audience (that's you!) consistently asked us about the best times to post on social media. We answered the question by compiling all of the different research studies we could find on the topic into a single blog post that provides the best times to post on every major social network. That blog post was so successful, we used the same methodology to write blog posts on the best times to send email and how often to post on social media. These compiled research blog posts are all among our top performers to date. My friend, Andy Crestodina, does an original research study every year to understand the progress made in the blogging industry. By publishing this original research, he gains tons of backlinks because he finds answers to common questions his following asks. You can do the same by writing a simple survey with a tool like SurveyMonkey and asking your following to provide their insight. Sometimes, there just isn't data to back up what your audience needs to know. This is a perfect use case for best practice content. You can use best practice blog posts to share step-by-step processes, theory-driven anecdotes, and more. Just be transparent when you suggest the best practice is your opinion and/or industry-wide accepted. Support software company, Groove, has attracted a huge audience of software entrepreneurs through the transparent content they share on their Startup Journey blog. Transparent content shares your process behind the scenes (similar to How I... content). Additionally, it can go even deeper, like sharing the entire company's salaries, as Buffer does with its Transparency blog. It's a great way to build trust with your audience. And as we marketers know, people buy from people they know, like, and trust. Like traditional newspapers often have Opinion sections for articles not backed by data, but rather, by anecdotes, you can also share your thoughts and rants on your blog to inspire engagement. Controversial content makes your readers question a behavior, belief, or sense of belonging. Tying that into your blog titles practically begs for clicks + readership. These are often personal success stories that help your audience solve their own problems. For example, we recently launched a Marketing Strategy e-course at CoSchedule and found out that many of you want to increase your email subscribers and traffic. I could share the tactics I've personally used to help increase our subscribers and traffic at CoSchedule in a How I... blog post with a title like: How I Increased Blog Traffic From 40k Pageviews Per Month To 1M+ In Less Than 2 Years. It's kinda like a case study that shares your process. Have you come across a product or book recently you know your audience would love? Write a review as a blog post. At CoSchedule, we actually reward this behavior from our users by offering them a discount when they publish and share their reviews. It helps us encourage user-generated content that helps CoSchedule reach a larger audience. What stories could you share that make your culture unique? Those ideas can inspire thought leadership within your industry; you just need to share them! Have you ever seen a new blog post and felt like you've already read it a dozen times? Adding a new metaphor (angle) can add a lot of flair to an overdone topic. Have data to prove something big is going to happen in your industry? What about an opinion of what is bound to influence your industry next year? This type of content sparks conversation, and definitely exemplifies thought leadership for your niche. For example, I often look to Joe Pulizzi in the content marketing industry for his foresight on the direction our industry is heading. He's captured my attention because of his predictions that he shares frequently through his podcast, emails, and blog posts. Learning what not to do is often as important as learning what to do. Sharing your mistakes to help others avoid making them not only shows your humanity, but can be extremely helpful for your audience. Do you have old blog posts that would be even better if you updated + optimized them a little? Take the time to improve those blog posts and publish them as if they were brand new pieces of content. This process not only saves time (you don't have to create a new blog post from scratch), but can help improve your rankings in search engines, increase the email subscribers you receive from that content, and boost your traffic, too. You can build industry credibility and thought leadership by both reading blog post comments and writing your own for the blog posts you read. This process can also help you develop new ideas for content and embellish upon others' ideas. For example, I've already written multiple blog posts about content types. Before I started writing the post you're reading right now, I read the comments on the other posts to make this one even more comprehensive. Social Media Examiner publishes blog posts, waits for the stats to roll in, and embeds blog post-specific podcasts into their most successful content. In this format, you typically host a guest in a Q&A format. It's what we do at CoSchedule with our popular Actionable Content Marketing Podcast. We write brand new questions for each guest based on their talents. Alternatively, you can do an interview-style podcast and always ask the same questions like Entrepreneur On Fire. Have you ever listened to This Old Marketing with Robert Rose and Joe Pulizzi from Content Marketing Institute? This is an example of a segmented podcast with two co-hosts. This is when it's only you speaking. As Grammar Girl demonstrates, these are good for answering common questions in quick-hitting episodes. That e-book you created earlier? Yeah, you can record yourself reading it out loud, then embed it in a blog post. At CoSchedule, we've found our most successful blog posts are complemented by what we call a per post email. That means we send an email to our list specifically dedicated to getting more readers to check out the content. If you're like us, however, you publish up to 10 blog posts a week. That means segmenting your list is extremely important for success so you don't over-email your audience. An easy way to do that is by sending new blog posts to those subscribers who have already clicked through to read similar content from your older emails. Many email service providers allow you to segment based on opens and clicks, which allows you to send more email to fewer—more targeted—subscribers. While there are many use cases for automation, an easy one to start with is a track for brand new content subscribers. Upon signup, send a welcome email, then test the waters with additional emails based on the first email's opens and link clicks. It's a blog post. But done with in video format. A product demonstration may be just what your prospects need to make a purchase decision. Often, these videos blatantly show how to do something desirable with your product to an audience who already understands the benefits your solution provides. Events make for amazing live streaming opportunities, particularly for those who just couldn't be physically present. Think conferences here. Facebook Live also gives you the opportunity to informally engage with your audience with video. Culture videos are a great way to give your audience a behind-the-scenes look into your business. It give them the chance to "meet" your employees, see the faces of those who they interact with on a daily basis, and learn how you solve problems with your team. Have you ever thought that the ball drop event at New York Times Square every New Year's Eve is really... just... a countdown? Is there an event in your industry that would work for you to increase excitement with a countdown? Workshops work particularly well in tandem with courses and conferences. These are a breakout session to teach something a little more in-depth than what you'd get with surface-level understanding from a standard session. Instead of a speaker, think of yourself (as the host) like a teacher. Interaction like a classroom is expected among students and teacher, even when your workshop is digital with a tool like Zoom. These can be in person or virtual summits. Think speakers, presentations, and training sessions + exhibit halls. Is a conference just a bit too much? You can go more informal + local with Meetups. For example, a friend of mine worked for a marketing agency and decided to host what he called monthly Content Strategy Meetups. Anyone from the Fargo, North Dakota, community could join in to see a local marketer present on a content strategy topic. It was a great way for him to meet marketers and position himself as a marketing thought leader in our community. Choose a specific time and day to meet every week, brainstorm a hashtag everyone who'll participate in the convo will use, plan a few topics + questions for those convos, and share your plans on Twitter. It's seriously that easy to start your own Twitter chat. HubSpot has done an excellent job with its Inbound Certified program. They give away free education that takes about 4.5 hours to complete (complete with video content in their lessons). Upon completion, you get to call yourself HubSpot Inbound Certified. You know what that does? People list that they are certified everywhere on their social media profiles which causes their peers to look for HubSpot for the same education. Really smart content play to draw in the right kind of following. NaNoWriMo is National Novel Writing Month and takes place every November. It's a challenge to write a novel in one month. The community challenges themselves to track progress, write thousands of words every day, and gives participants the opportunity to network, get pep talks, and meet peers online and in person. ^ What if your business could do something like that for your industry? This is typically a sales play with Live Chat showing on specific pages of your website (like your pricing page) to answer any questions that may prevent your prospects from converting. However, you can also use this as a marketing technique to engage and gather feedback, data, and ideas for marketing projects. Quora is the go-to source for questions + answers. You can gain big thought leadership points by freely sharing your knowledge there, and earn your business some credibility by including the company name in your title. Similarly, hundreds of reddit sub-communities are great resources for you to share content and actually get traffic back to your content. The marketing and startup industries have several examples of successful up-vote communities, including Product Hunt, Inbound.org, and Growth Hackers. This is when you literally take an article from your website and publish it somewhere else. It can be an effective way to increase your exposure, like how Buffer syndicated their blog content to popular publications like Fast Company and The Next Web. Just like you can (and should) accept guest blog content for your own blog, you can (and should) write content for other blogs in your niche. You’ve eliminated the costs and the time it takes to prepare and host an ongoing show. Better still, you gain immediate access to an exponentially larger audience, since you become the new value-add for each of the podcaster's tribes. It’s crowdsourcing, writ large. This is when you, as a guest, share your knowledge with another business' audience via a webinar. We've done it at CoSchedule with companies like Evernote, SEMrush, ActiveCampaign, and (coming soon!) Smart Passive Income. If you're a SaaS company, give your users a referral URL they can share with their friends in exchange for a discount for your software. It's a great way to encourage word of mouth while rewarding your biggest fans for being awesome. I went to a conference recently and listened to a PR/marketer talk about a sunflower butter client of hers. They pulled together recipes, supplies, and bottles of the sunflower butter to influential food bloggers. So what happened? They got lots of publicity from food bloggers with their own spins on the recipes, along with lots of new recipes for the sunflower butter brand. Very nice! A couple of years ago, a hospital in Fargo, North Dakota, recorded several PSAs and shared them through local radio stations. These were helpful tips on how to spot when folks were having a heart attack so you could save their lives, what to look for to understand if someone was having a stroke, and so on. Those PSAs all made the hospital feel like they really cared about the citizens in our community, which was a fantastic way to build their brand image (especially given their larger competition). When I worked as a marketer for an electrical distributor, we gave awards every year to our best suppliers and customers. It was a way for our business to recognize the collaborative efforts to grow together. Polls are simple one-question surveys with multiple choice answers. You can use tools already at your disposal like Twitter polls to gather feedback on content ideas and beyond. You can use surveys to gather data for original research, content ideas, product improvements, and a whole lot more. Surveys are particularly helpful tool to help you get to know your audience better, and even build audience personas (if that's your thing). Quizzes can be entertaining + reinforce the education you've provided through content marketing. For example, in the latest Marketing Strategy e-course from CoSchedule, quizzes complement each written lesson. Tools like Uberflip and Pressly exist to help you provide valuable content to your audience (even if you didn't publish it at your business). A curated content hub is a library of content you build for your audience from sources around the web. At CoSchedule, we have three different swag packets we ship to awesome customers, fans, and folks who help us out. The kits include t-shirts, posters, stickers, hand-written thank you letters, and more. Content Marketing Institute publishes and distributes its Chief Content Officer magazine every other month. It's a great way to connect with folks who want to disconnect from the tech. Think small local businesses with physical offices. These print marketing materials are essential to leave in your customers' hands as they walk out the door. Is there a conference that is popular with your audience? You can sponsor events like that to support the industry + build credibility with your following. Facebook targeting gives you an advanced way to reach a larger audience who is likely to be interested in your products or services. You can target your ads by location + interests + behaviors and a whole lot more to make the customer acquisition cost worth your while. Paid search puts your results at the top of the first page of Google. It's handy for targeting synonyms your audience uses to find the products or services you offer; particularly helpful when you don't organically rank for those keywords. This is when you pay a publication to place a piece of content you've created. It's popular with magazine-esque publications, but you'll also see many successful blogs placing guest posts as sponsored content. Imagine visiting a website's landing page about pour-over coffee carafes, but you didn't buy. You go to another website, and now you see an ad from the website you were previously on about pour-over coffee carafes. That's the power of remarketing. Magazine ads, newspaper ads, billboards, and the like are traditional "Mad Men" marketing tactics. The key to measurement here is to provide a way for your customers to tell you why/where they learned about your product or service. By gated content types, I mean the valuable content you give away in exchange for an email address. You can use tools like LeadBoxes from LeadPages to embed a link into a piece of content that includes a form. All your visitors need to do is provide their email address and you'll email them their free resource. Valuable gated content is the best way to build your email list. Period. Let's say you wrote a length blog post. A guide could be the blog post in a PDF version, a "Cliff's Notes" version of the blog post, or just highlight the big takeaways from the blog post. Worksheets are great for complementing blog posts that require following a process. They help your readers work through the ideas you're teaching them on their own so they leave your website with something tangible. At CoSchedule, we've found giving away free editable worksheets in Microsoft Word is extremely useful and immediately actionable. Templates complement blog content that requires data punching very nicely. Alternatively, a few of the templates we've given away at CoSchedule include slide decks (for pitching new strategies to your team), Photoshop CC action (to automatically size every image to the perfect size for every social media network), and even spreadsheets (for managing project sprints and more). Checklists are great for helping your audience cross their Ts and dot their Is when implementing a process. They complement blog posts well that cover process and actionable step-by-step information. If you're thinking about conducting original research and using a survey to gather your data, research reports are a great incentive to give your survey takers. A research report compiles your findings in a single document (typically into a PDF). We've gated a few posters and desktop backgrounds for specific blog posts on the CoSchedule blog. These help reinforce an idea by helping your audience see them daily in the office. Giving away image bundles makes sense for some industries. For example, when we announced CoSchedule's integration with Instagram, we gave away 100 Instagram-specific images in exchange for email addresses. You gals and guys loved it! This can include gamification or utility. How can you provide value to your audience as they use their mobile devices like smartphones, tablets, and e-readers? A couple years ago, CoSchedule created the Click To Tweet plugin for WordPress. We give it away for free and optimize the plugin's landing page to gather email subscribers. Make blog posts easily shareable with the Click to Tweet #WordPress plugin from @CoSchedule. The Chrome browser helps businesses empower their customers with utility-driven tools (extensions) that live right in the browser itself. If giving away one content upgrade generates email subscribers, would giving away two pieces increase your conversion rate? We tested the waters, and it appears the more content upgrades you give away for a single email address, the more conversions you'll get. Two years ago, CoSchedule launched the headline analyzer as a way to help our audience get more social shares, higher search rankings, and ultimately more traffic. We analyzed the data from the best content we've seen run through CoSchedule and made it available in an easy-to-use tool that ranks a headline's ability to emotionally connect with readers. That free tool has generated thousands of email subscribers, backlinks, and online mentions. Remember what I said about kits and bundles getting a higher conversion rate than only giving away a single piece of content in exchange for an email address? After you've created lots of content upgrades + tools, a resource library is a great way to repurpose your work in a high-conversion hub to generate more leads. Because. Well. Did you get the memo? You can use the standard content types and make your own custom content types with your CoSchedule marketing calendar. What will you organize now?